Heat oven to 350°F. Unroll 1 pie crust in 9-inch springform pan; press in bottom and up side of pan. In large bowl, beat cream cheese with electric mixer on medium speed until smooth. Gradually beat in 1/2 cup of the sugar. Decrease speed to low; beat in egg, blending just until smooth. Add lemon peel and juice; beat until smooth. Pour into crust-lined pan. 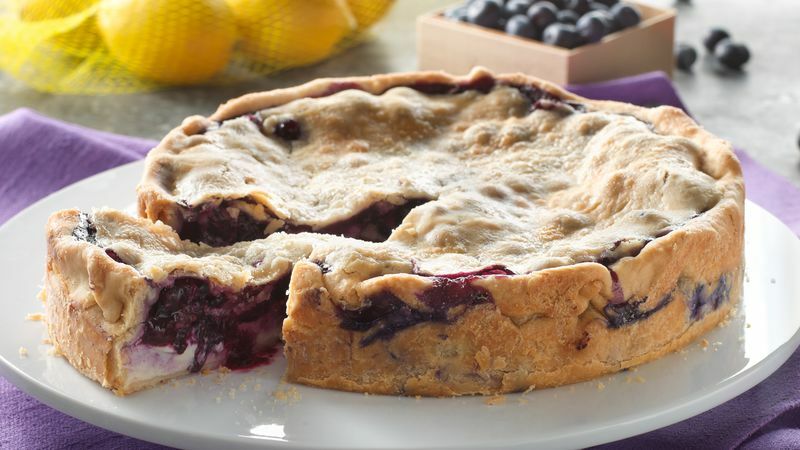 Toss blueberries with 1/4 cup of the sugar and the flour. Spoon on top of cream cheese mixture. Top with second crust; trim any excess crust. Pinch crusts to seal. Turn crust under, and flute. Cut slits in several places in top crust. Brush top crust with milk; sprinkle with remaining 2 teaspoons sugar. Place foil or cookie sheet on oven rack below middle rack to catch any spillover. Place pie on middle oven rack; bake 45 to 50 minutes or until crust is golden brown and filling is bubbly. Cool 1 hour. Refrigerate about 4 hours or until completely chilled before serving. Cover and refrigerate any remaining pie. Eat leftovers within 3 days. Swap the blueberries out for blackberries or raspberries for a different fruity twist.